According to a 2012 “Wealth Report” published by CitiBank and property consultancy firm Knight Frank, the world’s super rich expects Singapore to be the wealthiest country in the world by 2050. The report, which contains detailed analysis of interviews with high net-worth individuals (HNWIs i.e. people with more than US$25 million of investable assets each) – discussed economic, property and business trends that influenced the activities of the super rich. Among new world players, or emerging economies with the highest potential for economic growth, Singapore currently tops the affluence chart in terms of GDP per capita. Norway and the US follow in second and third place, respectively. By 2050, developing Asia is expected to overtake the west, with North American and Western European share of the global real GDP predicted to plunge from 41% in 2010 to 18% in 2050. 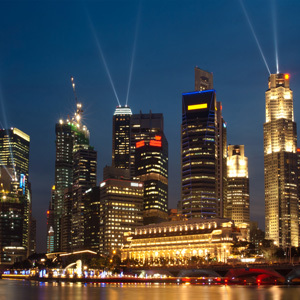 Singapore is expected to be at the forefront of the eastward trend in economic prosperity, with a forecasted per capita GDP of US$137,710, making it the world’s wealthiest country in 2050. Asian countries Hong Kong, Taiwan, and South Korea are predicted to move up to second, third, and fourth spots, respectively. Meanwhile, the US, formerly the world’s largest economy, is foreseen to fall to fifth place. “The report reinforces Singapore’s reputation as the preferred investment center for the world’s wealthiest,” commented Mr. Satish Bakhda, General Manager and Head of Operations at Rikvin, a Singapore Company Registration specialist. “This puts us in good stead to attract more foreign investors to form a Singapore company, and professionals to apply for the Personalized employment pass or Singapore work visa. As indicated by the report, Singapore is clearly on top of the emerging Asian boom. Now is the time to take advantage of Singapore’s overall economic prosperity, which, as global GDP trends demonstrate, will only multiply rapidly and substantially in the next few years,” concluded Mr. Bakhda.